It is your SUPPLIER´S PORTAL. 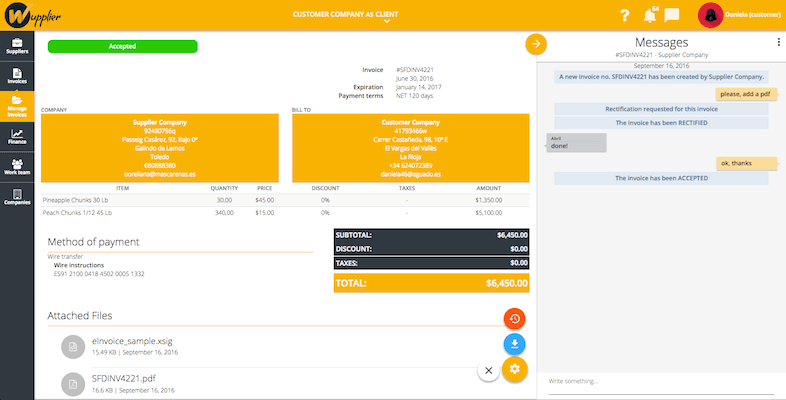 Simplify and automatize transactions with suppliers. Customized view to each account payables. 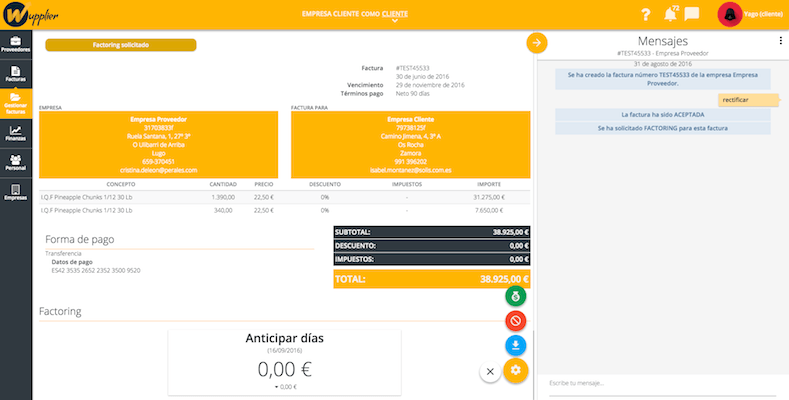 It allows for your suppliers to upload all invoices into the platform (PDF), from their own computer or cell phone, simply typing and attaching documents. It is the easiest possible way, from any device. Supplier's document and data management and consolidation (contracts, licenses, etc.). Instant payables claim service management thru an associated chat to every invoice, and also via SMS. Transparent access to state of accounts payables. Wupplier eliminates manual processes for your accounts payables. It simplifies your administrative management and relationships with suppliers. 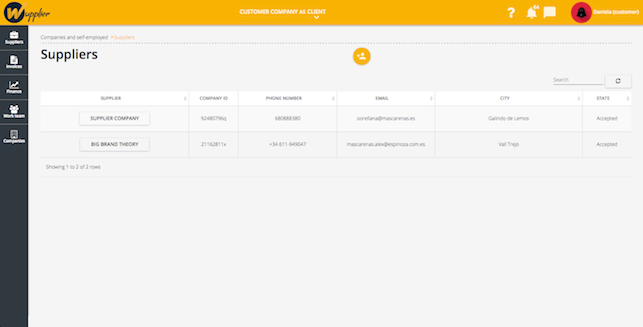 Invoice follow up, real-time interaction with your suppliers. Document consolidation and management (invoices, attachments, etc.). Compatible with any ERP software. We also offer your suppliers an invoice pre-payment service at a discount, providing the necessary cash flow when needed. Communication issues between clients and suppliers. Invoice discounts from advance payment service. 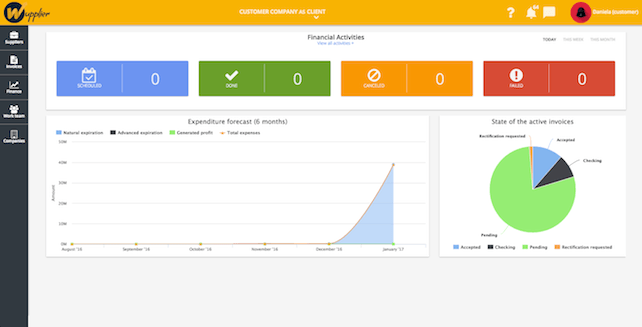 Invoice management and real-time financial information. Cost savings from the suppliers invoice cash advance and claim management services. Additional income for company treasury. Register the invoice and notify about its state and due date. Simplify the early invoice payment process management. We meet your team, and your working methodologies in order to share our experience and perspectives. We get to know your systems and only then we make a business proposal. 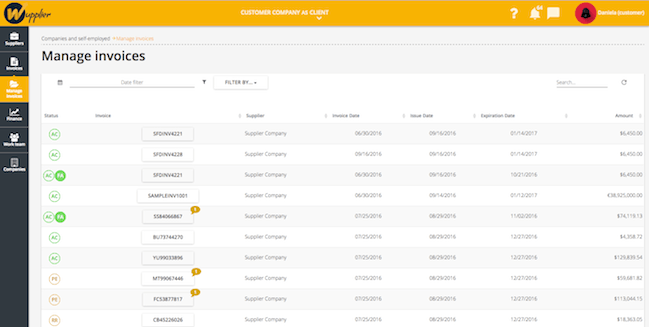 We fully integrate Wupplier with your systems, train your team and your main suppliers on how to use our platform. Once we measure the first results and succeed on the trial period, we then expand and activate all services for you to use Wupplier´s full potential with all of your suppliers. Web accessible portal for your suppliers to upload their invoices from any digital device. Integrative to any corporate system/environment and ERP. Security copies established at the client headquarters to guarantee content safety. Content management related to suppliers documentation, with a special focus on due dates. Our clients from this sector usually come from the food and textile categories. In this case, value creation comes from Wupplier´s capacity to manage and follow up on orders. There is also a common challenge among these companies: encounter high costs when it comes to digitalizing and mechanizing invoicing processes due to a range of technological disparity in each one of them, from those with complex informational systems to those who still operate manually, on paper. - Capacity to provide financing/cash flow to their suppliers. - Optimize the accounts payables process in their systems. Similar to other existing Wupplier clientele, the high volume of invoices these companies regularly receive is a common denominator for this sector as well. Without forgetting the complex influx for approvals, many times tied to milestones or variable objectives (certifications, permits, etc), and with direct intervention of the job site's property, ultimately accepting the expense and validating part of the process. - Manage the chain of acceptance for each expense: from the job owner, certifying company, builder and finally, the supplier. 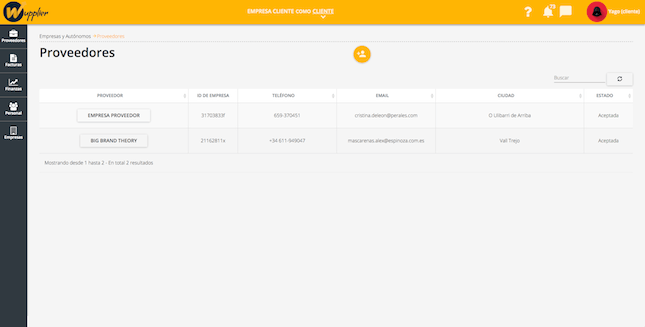 - Centralize all documentation related to each supplier (contracts), and to each invoice (certificates). - Provides transparency to the entire process and communicates its state to each party, and should there be a bottle neck, where is it located. Many suppliers, small and medium quantities=usually low efficiency processes. This industry gives Wupplier a very specific use, since automatize is crucial not to get distracted in operations, and therefore not to loose the core focus for their business. - Automatize the invoice reception, approval and order placement process. 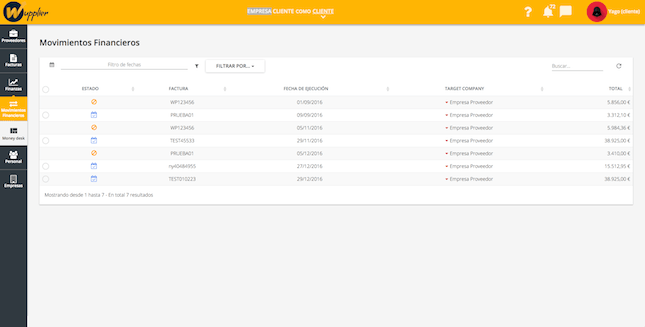 - Manage any potential claim in real-time, without deploying any other resources. - Using its app to verify the reception of the actual order within the approval influx process. You want to tell us something else? Your data has been received successfully. The agreement between WUPPLIER LLC and the users. The domain name through which you have accessed to this Website is held by WUPPLIER. Such domain name shall not be used in connection with other contents, products and/or services not owned by WUPPLIER nor in any way that may cause confusion among end users or discredit WUPPLIER. This Website will not be used in connection with other contents, products and/or services which are not owned by WUPPLIER and/or its affiliates and/or branch offices. For the purposes of this Legal Notice, Users are those persons accessing the Website and/or sending a request or email to the Website or completing a Website form or registration process. WUPPLIER is registered as Florida Limited Liability in the State of Florida on January 25th of 2017, with registered office at 175 SW 7th Street, suite 1701, Miami FL 33130, USA. Document Number: M17000000712. FEI/EIN Number: 36- 4852710. This Legal Notice contains the terms and conditions that regulate: a), the access, navigation and use of the Website; b) the responsibilities arising from use of the Website and the provision of and/or contracting of products or services which may be offered through the Website; and c), the provision and use of Website content. Notwithstanding anything herein, the foregoing is without prejudice to the fact that WUPPLIER may establish specific case-by-case conditions which regulate the use, provision and/or contracting of products or services which are offered to Users through the Website. In any case, those specific conditions will form an integral part of this Legal Notice. Performance by the User of any single act among the following will constitute acceptance without reservation of each and every one of the rules found in this Legal Notice and will be taken as consideration on the part of the User: a) accessing the Website:, b) filling out forms through the Website, c) sending requests for information or complaints, d) accepting contractual offers or subscriptions, e) responding to requests for curriculum vitae and, f) in general, all acts of a similar nature to those carried out when filling out forms and/or when contacting via email addresses published on the Website. You must therefore read and understand the content of this Legal Notice. Should the use, provision and/or contracting of products or services be offered through the Website, the mere fact of being used and/or requested by the User will constitute, equally, the User´s acceptance without reservation of the corresponding established specific conditions which will also form an integral part of this Legal Notice. Access to the Website by the Users is free. However, the use, provision and/or contracting of the products and services which may be offered by WUPPLIER may be subject to the previous acceptance of formal requisites such as the filling out of corresponding forms, payment of fees and costs and/or the previous acceptance of specific conditions which apply to the same. Merely accessing the Website does not imply the establishment of any link or commercial relationship between WUPPLIER and the User, except where the appropriate means have been established and the User has previously complied with the requisites which are established. Information on the Website relating to products or services offered by WUPPLIER is solely for information and advertising purposes, unless otherwise stated. If for the use, provision and/or contracting of a product or service offered through the Website, the User is obliged to register, he/she will be under an obligation to provide accurate information, guaranteeing the authenticity of all the data provided at the time of filling out the pre-established forms required to access the corresponding products or services. If, as a result of the User’s registration, a password is issued, the User thereby is bound to use it diligently and to keep such password secret. Consequently, Users will be responsible for the adequate custody and confidentiality of all identifying data and/or passwords, and are bound to not allow or facilitate their use by third parties, be it temporarily or permanently, nor to provide access to others. The use and/or contracting of products or services by illegitimate third parties acquired due to a fault or negligent use or misuse of a password given to a third party and/or the loss of the password by the User will be entirely the responsibility of the User. Furthermore, it is the User’s duty to immediately notify WUPPLIER of any circumstances which may lead to the improper use of identifying data and/or passwords, such as theft, loss or non-authorised access, so that WUPPLIER can proceed with prompt cancellation. Without limitation to any other provision hereof, for the duration of any such period during which any such circumstances are not communicated to WUPPLIER, WUPPLIER will be exempt from any responsibility which could derive from the improper use of the identifying data or use or misuse of passwords by third parties. In all cases, the access, navigation and use of the Website, and the use or contracting of the services or products offered through the Website, is the sole and exclusive responsibility of the User. The User is therefore bound to diligently and faithfully observe any additional instructions given by WUPPLIER or by WUPPLIER’s authorised employees in relation to the Website’s use and its contents. (i) Using any of the same in any manner which is against the law or that offends reasonable standards of general public morality, ethics or public order, or which is in any way contrary to the instructions of WUPPLIER. (ii) Using any of the same in a way which harms the legitimate rights of third parties. (iii) Accessing and/or using the Website for professional or business purposes or incorporating the services and contents of the Website as its own business activities. (iv) Using contents and products and, in particular, information of any nature which is obtained through the Website or the services, for advertising purposes or any form of communication which has direct sales purposes or with any other commercial aim, or for non-solicited messages aimed at a group of people, independent of their finality, as well as abstaining from commercialising or circulating in any way any such information. The use or application is expressly prohibited of any technical, logical or technological resources by virtue of which Users may benefit, directly or indirectly, with or without profit from the unauthorized exploitation of the contents and/or services of the Website. WUPPLIER makes no representation nor warranty related to the accuracy, reliability, completeness or timeliness of the content, services, products, text, graphics, links, or other items contained within the website, or the results obtained from accessing and using the website and/or the content contained herein. (i) The continuity of the website’s contents and/or the availability or accessibility of the website or its technical continuity. (iii) The absence of viruses and/or other harmful elements in the website or server which hosts it. (iv) The invulnerability of the website and/or the impregnability of the security measures adopted by the same. (v) The usability or performance of the website’s contents or services. (vii) Any other damages of any nature which may be caused by reasons pertaining to the website not functioning or to the defective functioning of the website or any other website or with regard to any links which fail. WUPPLIER applies reasonable measures to avoid errors in the contents published in the Website. Contents offered through the Website are updated periodically and WUPPLIER reserves the right to modify them at any time. WUPPLIER will not be held responsible for the consequences which may derive from any errors in any contents and/or services provided by third parties on the website. Any communication or transmission of contents to the website which infringes the rights of third parties and/or the content of which is threatening, obscene, defamatory, pornographic, xenophobic, which undermines personal dignity or the rights of minors or which is contrary to current legislation, or any conduct of the user which incites or constitutes a criminal offence, is totally prohibited. Likewise, the inclusion and communication of contents by Users which, i) are false or inaccurate and which may induce error or mislead other Users or WUPPLIER’s personnel, ii) which infringe the intellectual property rights of third parties, iii) which may undermine or harm the reputation or image of WUPPLIER; iv) which may be considered as illegal, misleading or unfair advertising, or v) which contain viruses or any other electronic element which may harm or hinder the functioning of the Website, the internet, IT equipment belonging to WUPPLIER or to third parties or access to the Website by other Users, is totally prohibited. To the maximum extent permitted by applicable law, in no event, including but not limited to negligence, shall WUPPLIER or any of our affiliates, branches or any of our directos, officers, employees, agents or content or service providers be liable for any direct, indirect, special, incidental, consequential, exemplary or punitive damages arrsing from, or directly or indirectly related to the use of, or the inabiity to use, the website or the contents, features, materials and functions related thereto. the total liability of WUPPLIER, affiliates, branches, directors, officers, employees, agents or content or service providers to users for all damages, losses and cuases of action whether in contract or tort (including but not limited to negligence or otherwise) arrising from the use of the websiteshall shall be limited to and not exceed the amount, if any, paid by the user to WUPPLIER for use of the website or purchase of products or services through the website. users waive the right they might otherwise have to trial by jury and to class and collective actions. The User agrees to hold WUPPLIER and any of its affiliates, branches, officers, directors, employees and agents harmless from any and all claims, liabilities, costs and expenses, including attorneys´ fees arising in any way from use of the website, the placement or transmission of any message, content, information, software or other materials through the website or for violation of the law or these terms and conditions contained in this Legal Notice. WUPPLIER may, at its sole discretion, deny, withdraw, suspend and / or block at any time and without prior notice, access to the Website to those users who fail to comply with this Legal Notice, being able to delete their registration and all information and files relating to the same. WUPPLIER shall not assume any liability to any user for the cancellation of access to the website for the cause stated in this paragraph. WUPPLIER is the owner and/or the rights holder and/or has obtained a corresponding licence of the intellectual property rights and/or image rights, where necessary and/or subsisting, pertaining to the contents available through the Website. The term “contents” as used anywhere herein, extends but is not limited to the texts, graphic designs, drawings, codes, software, photographs, videos, sounds, indices, images, brands, logos, expressions, information and, in general, any other creation which is protected by national regulations and international treaties on intellectual property. All intellectual property rights in and to all contents are reserved and, in particular, it is forbidden to modify, copy, reproduce, publicly communicate, transform or distribute in any way the totality or part of any contents included in the Website for public or commercial means unless with the prior, express and written authorisation of WUPPLIER or, as the case may be, from the third party owner or rights holder of the same. Among others, the use of any technology to extract and collect information and contents from the Website is forbidden. Access to and navigation through the Website will in no case be understood as a relinquishment, transmission, licence or total or partial transfer of any rights by WUPPLIER howsoever. Consequently, it is not permitted to delete, evade or manipulate any indicators of rights ownership (for example “copyright”, “©”, “trademark” or “™” indicators) or other identifying data, whether in favour of WUPPLIER or any other parties, and/or any technical protection mechanisms, fingerprints or whichever information or identification mechanisms may be contained in, or otherwise pertain to, any contents. Any references to names and commercial or registered brands, logos or other distinctive marks, which are owned by WUPPLIER or by others, implicitly forbid their use without the authorisation from WUPPLIER or from the owner or the rights holder. At no time, unless otherwise expressly stated, shall access or use of the Website and/or its contents, give the User any right whatsoever to the brands, logos and/or distinctive signs included in the Website, each of which is protected by Law. A description of the copyrighted work with respect to which a claim of infringement is being made. A description in reasonable detail of where the alleged infringing material is located. A statement that the sender has a good faith belief that the disputed use is not authorized by the copyright owner, its agent or the law. An electronic or physical signature of the person authorised to act on behalf of the copyright owner. A statement made under penalty of perjury that the above information in your notice is accurate and that the sender ids the copyright owner or authorised to act on such owner´s behalf. WUPPLIER may offer direct or indirect links to other Internet websites which are outside of the Website. The presence of these links in the Website have a purely informative purpose only and at no time constitute an invitation to contract the products and/or services offered on such websites. Furthermore, no such link implies the existence of a commercial link or relationship with the person or Entity owning the website to which the link is offered. In any such case, WUPPLIER will not be responsible for establishing general conditions to be taken into account in the use, provision or contracting of or for any such services or products and, as such, WUPPLIER may not be held responsible in any way in relation with any such products or services in any manner howsoever. WUPPLIER does not have the knowledge, human resources or technical means to control or approve the information, contents, products or services provided by or through other websites to which it offers a link from the Website. consequently, WUPPLIER will not take any responsibility for any matters relating to such third party websites linked with the website. specifically, without limitation, WUPPLIER will not be responsible in any way whatsoever for the functioning, access, data, information, files, quality, products and services, links and/or content of any such websites. Notwithstanding the above, where WUPPLIER becomes aware that the activity or the information which it links to is illegal and will lead to a crime or damage the rights or property of third parties, it will act promptly with diligence to delete or cease from using the corresponding link. Likewise, if Users become aware of the illegality of the activities carried out through any such third party websites, they will be under the obligation to communicate such matter to WUPPLIER at the earliest reasonable opportunity such that WUPPLIER may evaluate the same and act appropriately. (i) They will need to obtain prior, express and written authorisation from WUPPLIER. (ii) The link will only be made to the Website’s homepage, unless otherwise stated or authorised. (iii) The link will need to be absolute and complete, i.e. it must lead the User through a click to the main page and must include the whole of that page. In no case, unless otherwise authorised by WUPPLIER, will the webpage from which the link is made be able to i), reproduce in any way on the Website, ii), include the Website as part as its own website or as any frames from such website, or iii), be able to create a browser on any of the Website pages. (iv) On the website from which the link is established, unless with WUPPLIER’s express prior written approval, no declaration of any nature may be made to the effect that WUPPLIER has authorised the link. If WUPPLIER providing the link from its webpage to the Website wishes to include on its own webpage any brand, denomination, commercial name, label, logo or any other sign which identifies WUPPLIER and/or the Website, they must obtain previous, express and written authorisation from WUPPLIER. (v) WUPPLIER forbids the link to the Website from all those webpages which contain materials, information or contents which are illegal, degrading, obscene and in general, which infringe upon morality, public order, current legislation, generally accepted social rules or which harm the legitimate rights of third parties. Which data do we process? : For the fulfillment of the purposes described below, we will process identifying data and contact data. For which purpose do we process your data? : Your data will be processed to perform a demostration of Wupplier product, hopefully to stablish a business relation, and to send offers. To whom we may disclose your data? : We do not transfer your data to anybody, and if someday we send and offer from third parties, we will do it on their behalf. We never transfer your data. You may exercise the rights recognized in the current legislation on data protection, by sending a written communication to info@wupplier.com. The user shall send a copy of his/her national identity document, passport or any other valid document for his/her identification. WUPPLIER informs users of their right to submit a complaint before the competent Data Protection Authority when considering that the processing of their personal data violates the applicable data protection regulations. We use own and third party cookies for the improvement of our services through your navigation analysis, as detailed within our Cookies Policy. What are cookies. A cookie is a small piece of data sent from a website and stored in a user's web browser while the user is browsing that website, allowing it to query previous activity (Wikipedia). Blocking and deleting cookies. Web browsers can be configured in different ways to deal with cookies, allowing users to reject them or delete them after browsing. Check your browser's help files for further information on how to change the settings, or contact the developer. In any case, here you can find instructions for the most popular desktop and mobile browsers. Google Chrome, Mozilla Firefox, Internet Explorer and Safari. IOS, Android, Blackberry and Windows Phone. Please remember that restricting or blocking cookies from this website may result in loss of functions or in some of the services not being available. Cookies used by WUPPLIER: Our web cookies are only associated with an anonymous user and your computer. These cookies will never be used to provide or collect personal data. WUPPLIER reserves the right to modify any of the terms and conditions of this Legal Notice without prior notification and the particular terms and conditions which may have been established for the use and/or contracting of the products and services provided through the Website, whenever it deems it appropriate due to business reasons and/or in order to adapt and comply with any changes in legislation and in technology which have become effective since the last publication of the same on the Website. The term of this Legal Notice coincides with the duration of its publication and exhibition in the Website, until such time as it is totally or partially modified. At such moment, the modified terms & conditions will become binding. WUPPLIER may, at any time, finalise, cancel or interrupt access to the published content. In any such case the User will have no right to claim compensation of any kind. Following any such cancellation, the prohibitions that are set out above in this Legal Notice regarding the use of contents will remain valid. For any communication between WUPPLIER and the User, the User must contact with WUPPLIER through the postal and/or email address provided on the Website. Communications from WUPPLIER to the User must comply with the contact information provided by the User. The User therefore expressly accepts the use of the email address provided as a valid means for the exchange of information between WUPPLIER and the User. Where there is any discrepancy between the effects of this Legal Notice and the particular terms & conditions which may be established in relation to any specific products or services offered in the Website, the latter will prevail. Where any one of the provisions set forth in this Legal Notice could be considered as not being totally or partially binding by a Court of Law or by a recognised regulatory body, such nullity will not affect the other provisions contained in this Legal Notice nor any other provisions which have been established. Where WUPPLIER does not exercise any of the rights contained in this Legal Notice, such event will not constitute a relinquishment of this right, unless expressly stated in writing. This Legal Notice, and any relationship arising out of its acceptance or related hereto, shall be governed exclusively by the laws of the USA. The competent courts to resolve any controversy that arises from or is related to this Legal Notice and/or any relationship arising from its acceptance will be determined according to the applicable law. © 2018 WUPPLIER LLC – All rights reserved. PLEASE CAREFULLY READ THE FOLLOWING SOFTWARE LICENSE CONTRACT (HEREINAFTER CALLED "LICENSE") BEFORE USING THE SOFTWARE OF WUPPLIER LLC (HEREINAFTER "WUPPLIER"). USE OF THE SOFTWARE OF WUPPLIER WILL BE UNDERSTOOD AS CLEAR EVIDENCE OF THE ACCEPTANCE OF THE TERMS AND CONDITIONS OF THIS LICENSE. IF YOU DO NOT ACCEPT SAID CONDITIONS, DO NOT INSTALL OR USE THIS SOFTWARE. The present general conditions regulate the use of the applications of Wupplier. The present general conditions of use are a contract between You and Wupplier. This contract specifies the use of the application and of all related documentation, as well as the updates and improvements that substitute or complement the application for all effects and that are not distributed with a separate license (together, the "Application"). The Application is exclusively directed towards users that are resident in Spain. The users that reside or have an address in any other place and that decide to access and/or use this Application will do so under their own responsibility and risk, and must ensure that said access and/or use complies with the applicable local legislation. Wupplier may, at their own discretion, develop future updates of the Application. In this case, it is possible that said updates may not necessarily include all of the existing software functions, nor new functions that Wupplier designates to new or different devices. Through the present acquisition, Wupplier concedes (without selling) a personal, limited and non-exclusive license to install and use the Application with non-commercial objectives in a single authorized mobile device, as is stated in this contract. With this, the user acquires rights subject to compliance with the present License. Any type of commercial use is expressly prohibited. The user is expressly prohibited from carrying out any type of sub-license, rent, lease, transfer or any other type of distribution of the Application and the right to use it. The duration of the License will start on the date that the user installs, or uses in any other manner, the Application and will end when the following occurs, whichever is first: disposal of the Application or rescission by Wupplier of this License. The right to use the Application is limited to the above-granted License; it may not be copied, shown, deactivated, distributed, executed, published, modified, transferred nor may works derived from the Application be created, or use of the Application or any component of the same, except where there is express authorization from Wupplier. Unless permitted by Wupplier, it is prohibited to make a copy of the Application available on the internet that could be used by different users. It is prohibited to make the Application accessible through a network that would permit its download by different users. The user acquires a license for this Application, therefore their rights in relation to the same are subject to the present contract. Except in cases where there this document provides express authorization in another manner, Wupplier reserves all rights, titles and interests in the Application (including all characters, scripts, images, photographs, animations, videos, music and texts) and all related rights to copyright, commercial trademarks and intellectual property. This License is limited to the intellectual property rights of Wupplier and the Application licensees, and does not include rights to other patents or intellectual properties. In accordance with the establishments of applicable legislation, the user may not, under any circumstances, decompile, disassemble or use inverse engineering techniques on the Application or any of its components. You may not delete, alter or hide any identification of the product, the copyright or other intellectual property rights of the Application. Wupplier reserves all rights that are not expressly transferred in this document. In exchange for using the Application and as the user's contributions through the use of the same may give rise to copyright pretensions, the user, though the present document, cedes to Wupplier a license and rights to use their contributions in a global environment, exclusive, perpetual, irrevocable and completely transferrable, in any manner and for any effect in relation to the Application and the goods and services related, including the right to reproduce, copy, adapt, modify, exploit, exhibit, publish, release, transmit or make them public in any manner, known or not, and to distribute them without the need to notify the user or grant any compensation during the entire duration of the rights of intellectual property derived from the applicable international agreements and laws. This transfer to Wupplier, and the refusal of any compensation, will outlast any rescission of the present contract. The User commits to make adequate and legal use of the Application in conformance with applicable legislation, the present General Conditions of Use, as well as good habits and morals that are generally accepted and public order. The User must abstain from unauthorized or fraudulent use of the Application; accessing or attempting to access restricted resources of the Application; to use the Application with purposes or objectives that are illicit, illegal or contrary to the establishments of the present General Conditions of Use, good faith and public order, or that have adverse effects on the rights and interests of third parties, or that could damage, disable or overload or impede normal use or enjoyment of the Application; cause damage to the Application or to the systems of suppliers or third parties; to introduce or spread computer viruses or any other physical or logical systems that are susceptible to provoking damages in the systems of Wupplier, third party suppliers and other users; to obtain or attempt to obtain content by using methods or procedures other than those that, depending on the situation, have been made available for this effect. The User cannot delete or alter the commercial trademarks or the logos of the Application, nor the legal notices included in the Application or in the related goods. The right to use the Application also depends on compliance with the terms of any applicable agreement that you may have established with third parties through use of the Application. For use and access to certain functions of the Software, Wupplier and certain services may require that you create a unique combination of username and password, which will receive the name of "Registration Form". The data entered by the User must be precise, current and true at all times. The User will be responsible at all times for the custody of their password, assuming therefore any damages and loss that may be derived through incorrect use, as well as transfer, revelation or loss of the same. If the User stops using their account, they can cancel it by removing their details from the website of Wupplier. Data for diagnosis and use. You express your agreement for Wupplier to gather, maintain, process and use information for diagnosis, technical information, usage information, and other related types of information including (but not limited to) information about your device that is gathered periodically as part of the software update services, product technical support and other services provided in relation to the Application or in order to verify compliance with the terms of the present License. Wupplier commits to use this information solely and exclusively in order to provide products and services of Wupplier and to improve those existing, provided that said information does not identify you personally. You will voluntarily provide the data necessary to create a user profile and express your agreement so that Wupplier can gather, maintain, process and use said information, including but not limited to, a user name, a password, an e-mail address and other necessary information for using the Application and the Services. 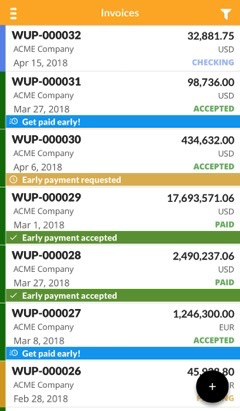 Wupplier may use this information for the application of the services that are subject to this contract and in order to offer special content and promotions to users in their own name or in the name of third parties. If you do not give your permission to Wupplier to gather, maintain, process and use this information, do not download or use the Application or the Services that are the object of this contract. Wupplier may provide certain services through the Application based on geographical location information. In order to offer and improve said services, where available, it is possible that Wupplier may transmit, gather, maintain, process and use your location data, including the geographical location of the device in real time, which is installed in the Application, therefore you accept and consent to the operations of gathering, use, transmission, maintenance, processing and use of said location data by Wupplier in order to provide said services. Also, by using the Application, you accept and consent to the operations of collection, use, transmission, maintenance, processing and use of information related to your account and any devices registered here in order to provide said services or functions. This information may include, but not necessarily be limited to, the ID and name of the account, as well as geographical location in real time of your device at the time the registered user of the Application requests it. If you do not give your consent for the collection, maintenance, processing and use of your location data, do not download or use the Application. User's rights to access, rectify and cancel. In compliance with article 5 of Organic Law 15/1999, of December 13th, of Personal Data Protection (LOPD), WUPPLIER LLC, notify you that the personal data obtained through this form will form part of an automated database owned by this entity, with the objective of processing your request, offering information about the services of WUPPLIER LLC with respect to the content of said request or, where applicable, about the status of processing of the same, as well as any other information related to such aspects. The data is and will be treated by WUPPLIER LLC in accordance with the valid legislation in relation to personal data protection. You can exercise your rights to access, rectify, cancel and oppose with respect to your personal data in conformance with the dispositions of articles 23 and following of Royal Decree 1720/2007, of December 21st, of development of Organic Law 15/1999, of December 13th, of Personal Data Protection (RDLOPD) through the e-mail address info@wupplier.com or through the contact form on this website. The Application permits access to the services (hereinafter called, jointly and individually, the "Services"). The use of said Services requires Internet access and (sometimes) the creation of a user account through the above-mentioned Registration Form, and, in addition, you may be required to accept a series of additional service conditions and be subject to the payment of additional fees. The User must pay for their own equipment, Internet connection, mobile devices and service plans in order to access the Application and use it. Wupplier does not guarantee that this Application can be accessed from any device or wireless service plan. Furthermore, Wupplier does not guarantee that the Application is available in all geographical points. The user accepts that by using the Application their wireless operator may charge them the stipulated fee for data, messaging and other wireless access. Therefore, they must consult what charges are applicable to them with their operator. YOU ARE THE ONLY PARTY RESPONSIBLE FOR THE EXPENSES THAT MAY BE DERIVED FROM ACCESS TO THE APPLICATION FROM YOUR MOBILE DEVICE. You recognize that, by accessing any of these Services, you may encounter content that you consider to be offensive, indecent or censorable and that may or may not be considered as language suitable for adults. Given that it is possible that Wupplier may not have any control over sites and information that may include information considered to be offensive, indecent or censorable, you are aware that you are using the Services at your own risk. You recognize that the Services may include content, information and material of a private nature that is the property of Wupplier, and which is protected by the applicable legislation related to intellectual property and other laws, including but not limited to laws related to copyright, and it is understood that you will not use said content, information or material of a private nature in any way, except in relation to the use of the Services in conformance with the terms of the present contract. No part of the Service can be reproduced in any form or manner. On the other hand, the Service that can be accessed through the Application are not available in all languages nor in all countries. Wupplier does not guarantee that said Services are adequate or available for their use in any particular location. At the time the user decides to access these Services, they do so of their own accord and are responsible for compliance with all applicable laws, including, among others, local applicable laws. Wupplier and its licensees reserve the right to modify, suspend, eliminate or deactivate access to any Service at any time and without prior notice. Under no circumstances will Wupplier be responsible for the elimination or deactivation of access to said Services. Wupplier may also impose limits for the use or access to certain Services, in any circumstance, without prior notice and declining all responsibility. The user recognizes and accepts that neither Wupplier nor its licensees have the explicit or implicit obligation to offer, or continue to offer the Services now or in the future. This License will remain in force until the validity ends. The rights granted by this License will also end or lose validity automatically without any prior notice from Wupplier if the user does not comply with any of the conditions of the present License. When it is no longer valid, use of the Application must cease and all copies, whether total or partial, of said software must be destroyed. Sections 2, 3, 5, 7, 8, 9 and 10 of the present License will remain valid after the License is no longer valid. You can cancel and rescind the current contract with Wupplier by following the instructions published on the website. Deleting the Application from the various devices where it was installed is not sufficient to rescind the current contract. You recognize by accepting this contract you must follow the instructions published on the website in order to rescind this contract with Wupplier. Wupplier does not guarantee the availability and continuity of Application operation. In consequence, Wupplier will not be responsible under any circumstances for any damages and loss that may be derived from the lack of availability or accessibility to the Application, the interruption of operation of the Application or computer failures, telephone problems, disconnections, delays or blocks caused by deficiencies or overloads on the telephone lines, data centers, in the Internet system or other electronic systems produced during the course of operation, and any other damages that may be caused by third parties during unauthorized use beyond the control of Wupplier. Wupplier does not guarantee the absence of viruses or other elements in the Application introduced by third parties outside Wupplier that may produce alterations in the physical or logical systems of the User or in the electronic documents and files stored on your systems. In consequence, Wupplier will not be responsible under any circumstances for any damages and loss of any kind that may be derived from the presence of viruses or other elements that could produce alterations to the physical or logical systems, electronic documents or files of the User. Wupplier adopts various measures of protection to protect the Application and the content from third party computer attacks. However, Wupplier does not guarantee that unauthorized third parties do not know the conditions, characteristics and circumstances in which the User accesses the Application. In consequence, Wupplier will not be responsible under any circumstances for the damages and losses that may be derived from said unauthorized access. By signing the present General Conditions of Use, You declare that you will hold Wupplier harmless from any claims, as well as the parent company, directors, members, employees, lawyers and agents, derived from non-compliance by the User with any of the dispositions contained in the present General Conditions of Use or with any law or regulation applicable to the same, non-compliance or violation of the rights of third parties and non-compliance with the permitted use of the Application. You expressly recognize and accept that, as permitted by current law, the use of the applications and services is at your own risk, and that you assume completely the risk related to satisfactory quality, performance, accuracy and effort. In accordance with the limits permitted by current law, the Software and the Services are provided "as is", with all possible defects and without any type of guarantee, and Wupplier and its licensees exclude all guarantees and/or implicit or legal conditions, including but not limited to the guarantees and/or implicit conditions of marketability, satisfactory quality, appropriateness for a particular objective, accuracy, enjoyment and non-infraction of third party rights, all in relation to the application and the services. Wupplier does not guarantee, without prejudice to the use and enjoyment of the Application or the services of Wupplier, that the functions contained in the application or the services of Wupplier, or the services performed or provided by said software, will satisfy your needs, that the use of the application or the services will be uninterrupted or error free, that the application or the services are compatible with third party software or materials, or that the defects of the application or the services will be corrected. You also recognize that the application and the services are not destined to nor adequate for use in situations or environments where the faults or errors or inaccuracies of the content, data or information provided by the application or services may lead to death, personal damages, material damages, serious physical injury or significant damage to the environment, including but not limited to the activities of nuclear plants, navigation systems or aircraft communication, air traffic control, hospital facilities or weapon equipment. No verbal information or advice from Wupplier or an authorized representative of Wupplier will provide any guarantee. In the case that the Application or the Services are defective, you will assume the entire cost of all services, repairs and corrections necessary. Taking into consideration that the imperative standards of some countries do not permit the exclusion of implicit guarantees or limitations to the legally established consumer rights, the previous exclusion and limitations may not be applicable to you. Wupplier will not be responsible under any circumstances, within the applicable legal limits, for the personal damages or loss of earnings or general damages, nor for special damages, whether direct or indirect, including but not limited to physical damages, material damages, damages for loss of income or data, interruption of business activity or any other type of commercial damages or loss, resulting from or related to the use or incorrect use of the application, regardless of how it has been caused and independently of the theory of civil responsibility (non-compliance with contract, illicit act and others) and even if Wupplier has been informed of the possibility of these damages. Some countries do not permit the limitation of responsibility for personal damages, loss of earnings or general damages, whether direct or indirect, therefore this limitation may not be applicable to you. The total responsibility of Wupplier for damages and loss (other than those required by current law in cases where personal damages are related) will not exceed, in any case, the quantity of twenty United States dollars (20 USD). The above-mentioned limitations will be valid even if the mentioned repair does not comply with its essential objective. 9. Applicable law and independence of stipulations. The present General Conditions of Use, as well as the relation between Wupplier and the User, will be subject to and interpreted by Spanish law. The parties agree to be subject to the exclusive jurisdiction of the courts and tribunals of Miami for the resolution of any disputes related to the present General Conditions of Use or the relationship between the same. The present License constitutes the entire agreement between Wupplier and You with respect to the Application and the Services, and substitutes all previous or current agreements related to this object. The present License may only be modified through a written agreement signed by Wupplier. Translations of the present License respond to obligations imposed in each country; in the case of discrepancy between the version in Spanish and versions in other languages, the version in Spanish will have priority as long as it does not contest local legislation in its jurisdiction. Some components of the Software use or incorporate software of third parties and other materials that are subject to copyright. The credits and terms of the license, as well as other limitations of responsibility for said material, are contained in the electronic documentation of the Application, and the use of said materials is regulated by the respective terms of each license.